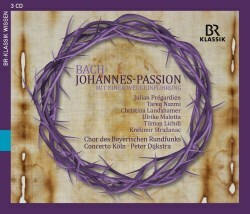 Following hot on the heels of the 2013 release of Bach’s St. Matthew Passion the Chor des Bayerischen Rundfunks and Peter Dijkstra appear with this live recording of the St. John Passion. Primarily aimed at the German home-market the set contains a third CD lasting 71 minutes which is an introduction to the work from Markus Vanhoefer. It includes excerpts and explanations spoken in German. The 1750 obituary of J.S. Bach claimed that he had written five passions. Only the St. John and the St. Matthew have survived in their entirety. Two others are lost and the St. Mark is incomplete. Having been appointed Cantor et Director Musices at Leipzig, Bach and his family arrived in the city in 1723. The terms of appointment made him cantor at Thomaskirche and music director for all four churches in the city: the two main parish churches Nikolaikirche and Thomaskirche, and also Neue Kirche and Peterskirche. It can’t have been long after settling there that Bach began working on the St. John Passion. For the present performance Dijkstra opts for the 4th version of 1749 exactly as edited in Bärenreiter Urtext; using double bassoon and no viola d’amores. Dijkstra employing elements of historically informed performance practice directs the period instrument ensemble Concerto Köln using 23 players. The Chor des Bayerischen Rundfunks deploys a choir of 34 members: 18 women and 16 men. Dijkstra’s combined forces are considerably smaller, especially the orchestra, to those he employed in 2013 for the St. Matthew Passion. Cast in forty sections, the St. John primarily uses texts from St. John's Gospel with the remainder taken from a variety of sources, including the Gospel of St. Matthew, Psalm 8:2 and chorale texts. Bach intended the work for Good Friday. It was first performed in 1724 at the Good Friday Vesper service at the Nikolaikirche, Leipzig. It would have been integrated into a service that would also have included sermons and communion. Consequently the whole would have taken considerably longer than the Sellars/Rattle account. The Chor des Bayerischen Rundfunks deliver full-toned singing marked by a compelling and often moving unity that is constantly rewarding. Exceptional is the clarity of meaning and thrilling power of the singing particularly in the opening chorus Herr, unser Herrscher and in O hilf, Christe, Gottes Sohn, durch dein bitter Leiden. Dijkstra has selected his team of soloists remarkably well with each speaker and singer demonstrating an innate sympathy for the sacred text. Telling the story in the crucial role of Evangelist tenor Julian Prégardien demonstrates his affinity for the texts. He is remarkably consistent and has a stunning clarity of diction. In the part of Jesus bass Tareq Nazmi presents satisfactorily yet lacks the lucidity of Prégardien. Tilman Lichdi is in fine form offering both conviction and reverential expression especially in his arias Ach, mein Sinn and Erwäge, wie sein blutgefärbter Rücken. Beautifully sung to an extended viola d’gamba solo I greatly admired the pain, anguish and again reverence in Es ist vollbracht! by alto Ulrike Malotta. The aria Von den Stricken meiner Sünden accompanied by oboes is well controlled but would have benefited from clearer diction. There's commendable enunciation and rounded tone from bass Krešimir Stražanac in the arioso Betrachte, meine Seel and also the aria accompanied by the chorus Mein teurer Heiland. Soprano Christina Landshamer excels in her Ich folge dir gleichfalls, accompanied by flutes. There's piety there and just the right amount of expression. The admirable Landshamer gives anguish and a sense of near unbearable pain to her aria Zerfließe, mein Herze, in Fluten der Zähren. With his usual calm assurance director Dijkstra pulls his forces together to reveal plenty of fine detail as well as the often dramatic emotions of the liturgical texts. Concerto Köln supply first-rate support with particularly well judged expression and give a number of exquisite solo accompaniments to individual singers. Here on BR Klassik the experienced sound team maintains the high quality sonics we have come to expect from this label. In the accompanying booklet there is an informative essay, which discusses the various versions of the score. The author is Karl Böhmer and his German text is accompanied by an English translation. Full texts are provided in German but disappointedly there are no English translations. For those wanting to see a production of St. John Passion it is certainly worth obtaining the Sellars/Rattle DVD/Blu-ray on the Berliner Philharmoniker's own label. It’s a live performance full of wonderful insights. On CD the strongest competition is twofold. I admire the spirituality of the 1990 period account from the Tavener Consort and Players on period instruments under Andrew Parrott recorded at Abbey Road, London on Virgin Veritas. Karl Richter was steeped in the music of J.S. Bach. His account directing Münchener Bach-Chor und Orchester was recorded in 1964 at the Herkulessaal, Munich on Archiv Produktion. Such a highly progressive work for its time, Bach’s St. John Passion, full of terror and menace, communicates a stark message. Dijkstra does indeed step forward with an inspirationally intense performance that made me regret not being in the splendid Herkulessaal for this sacred masterwork.